Welcome to C&L's Bloom Day Celebration! We do have spots of color here and there. Red leaves on the Rough Leaved Dogwood and the few remaining flowers of New World Asters or ex-asters as our friend Mr McGregor's Daughter refers to them. My favorite spot of color is the purple of the adirondack chairs. Now that the bugs have disappeared it's a good place to sit and dream of next season's garden. Not all the bugs have gone....A little pesky grasshopper with Coneflower. Have you met Fred? He's the sulphur butterfly that has been visiting with me for many warm days. He follows me around the garden, teasing me with his flitting and then gently lands on the Pineapple Sage for a rest...I prefer to think of it as posing for me. Salvia 'Coral Nymph' will bloom until a killing frost takes her out...If you're lucky, there will be seedlings next spring. Flowering cabbage will light up the garden all winter~sometimes it sends up a flower stalk in the spring....It insures the garden has its fair share of Cabbage White Butterflies. I love Susans and Rudbeckia triloba is tied with all of them for favorite ! A few of the New World Asters that this garden cannot do without! Thank you for stopping by~Bloom Day is the creation of Carol, our delightful hostess. For more Bloom Day celebratory hosts then you can imagine pop over to May Dreams Garden. Stay tuned for reports on an exciting visit over the mountains to Fairegarden. Yes you have splashes of color dotted around. The chairs still look great and yes dreaming of the next garden season is in full swing around here. The PPPP seems to be settling in quite nicely!! I thank you everytime I check on it..
Oh and I can't wait to read about your visit over the mountains...you and Frances are quite the pair!! Your purple chairs set among the fall foliage look very inviting. Happy GBBD! Beautiful BD! I love all the asters and the ornamental cabbage. Just a little jealous of your sulfur photograph, I can never get them to be still! I love crisp mornings and the freshness of the autumn air. How fun for the Sulphur butterfly to follow you around -- they do seem to tease. Your hyacinth bean is so pretty. When the kids were little they loved seeing the seeds calling them Mini-Oreos. I really like the Coral Nymph. Thank you for nice stroll through your garden Gail, I stop a few seconds to enjoy the Hyacith bean it is really pretty, is it fragrant too? Looking forward to the mountain posts. What a beautiful sunrise, Gail! That would be enough to make me get up so early in the morning:) Good to see so much color still in your garden; I'm amazed at how long your asters have been blooming. Although the butterflies have long since fled from here, I still see a relative of Fred's flitting about on sunny days--perhaps a distant cousin? Hi Gail, your garden is moving toward winter very gracefully. We are having a mild Nov so the perennial foliage still looks pretty good here. The pineapple sage is a hardy performer. It's blooming here, too. 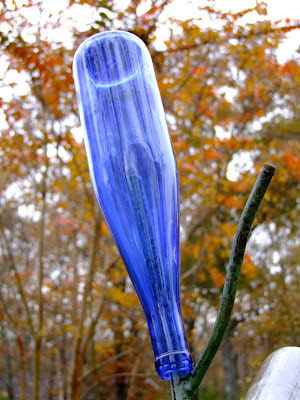 And that blue bottle tree -- does it self-seed? Happy blooms day, Gail. You have lots of lovely color there! I need to try hyacinth bean again. I got it in late the year I planted it, and it only had a couple blooms when we had our freeze, and it never went to seed. That bottle bloom is a wonderful blue! I love the fall blooming crocus. Your purple chairs are great! I am in love with that Salvia, what a soft and unusual shade. And those 2 chairs look perfect for relaxing, and some garden contemplation. You still have some lovely blooms there Gail. That is one weird looking bug on your coneflower though! My Coral Nymph is still blooming away as well (I forgot to get a photo of it for Bloom Day!) This year it got a bit out of hand with all the self-seeding that went on. That area got too messy looking so I'm hoping to move next year's seedlings to a better, wilder place. Happy B.D.! Thanks for the shout out. How long have you been naming the butterflies, or is this one a pet? He seems rather a show off to land on the crimson bloom for his photo op. Rudbeckia triloba has an elegant simplicity, it's easy to see why it's a fav. Your breakfast sounds delicious. And a trip to Fairegarden? What fun will that be. Are you bringing chocolates? Enjoy! Lucky you. All that colour is wonderful! A fun post with a variety of interesting photos... love the view of the lonely chairs and the little grasshopper. :-) Are you getting ready for Thanksgiving? I'm thankful that both our children will be here with their families for a few days! Yea! Fred sounds like a great gardening pal, Gail. Your garden has so much color left compared to my poor, grey-brown garden. Thanks for sharing some pictures. Love the pineapple sage. Hey, best wishes for surgery. That's no fun. I hope everything goes well and you have a speedy recovery. I love the pineapple sage and the cabbages! It's great you have some nice color in the garden still. I too am enjoying the coffee/sunrise combo, although I wish those sunsets weren't coming so early. Hi Gail....it is lovely to sit and dream of the garden in springtime....perfect for this time of year. You have so many pretty blooms.....I have a few left, but the continuous rain is taking its toll on them. I dearly wish I could sit and sip coffee with you in the purple chairs as we watched the sun rise. Someday! I'm so sorry your thumbs are still troubling you. I encourage you to have the surgery if that's the best option for treatment. Now's a good time ... you'll have the winter to recuperate & rehab so you can get busy in spring! I'm glad you're getting some nice days to enjoy your lovely garden. Hi Gail, I must be getting old, or stubborn in my old age, but while I make note of new plant names, I much prefer the old. Asters will always be asters to me. I think if Fred could talk he'd agree! Ouch, I sure can empathize about your De Quervains - I have it in both wrists and it can be quite painful. Happy bloom day Gail! That yellow butterfly is so beautiful. Thanks for sharing. Gail, your sunrise photo is beautiful. Early morning always feels so hopeful to me. Wish I had a "Fred" to following me around the yard. He looks to be a delightful companion. I'm attracted to your fall blooming crocus. Seems that I checked into them a while back and found that they're not for zone 4. Hi everyone, Thank you for stopping by...I've been on the road and didn't have access to my computer. Donna, Crocus speciosus will grow in zone 4...High Country Garden sells them. Good luck! Linda, So sorry you have that condition, too. I am opting for surgery because I am SO right hand dominant that even brushing my teeth hurts! The sulpher butterflies are fluttering around here too. I was tempted to get some flowering cabbage but for right now I just don't have time to plant! I suspected that when your posting and Frances' postings declined in frequency that you two were somewhere together! What gorgeous garden shots for this time of year. I will have a cup of hot tea instead of coffee on these cool mornings if you don't mind. I would love to sit in one of those purple chairs and chat over the garden. HGBBD. I can't wait to hear about your visit. Gail, everything looks great. To see my garden you would think the first frost has already hit. It's amazing what 2 months of neglect can do, but it will be back all beautiful next spring. I'm SO jealous of you girls with all your blooms in November. It looks absolutely beautiful at C&L Gail. I'd love to sit in one of those divine purple chairs with you and sip on some coffee while taking in the view. I remember admiring Salvia 'Coral Nymph' last year. It does well for you. Happy (belated) bloom day. Looks like you still have a lot going on up there. :) My garden looks like a wrecking ball went through it right now. I still have a couple of rosebuds and the jessamine vine to keep me happy though. Love how the chairs in the second photo echo the morning sky in the first and then find more echos in the ex-asters. I've got Wonder of Staffa, a still-aster, but its flowers are long gone. Still some magical color in your autumn garden! Oh my a butterfly too! I am sure that blue bottle and the tree it's on make for great winter interest! !I love that idea! Doing as well as can be ..expected her..in the holding pattern waiting for appt.w/ surgeon..soon soon all this will be in the rear view mirror! Gail such lovely flower photos but I especially love the sky and the trees. Such lovely photos Gail, we are lucky to have a few late bloomers this year that weren't killed off by summer heat aren't we! I think you're grasshopper is a first instar baby mantis of some sort, i had them hatching out like crazy from a hoya I brought in and went to id them after the cat brought the 6'th one or so, lol. The remains of the garden have such a bittersweet beauty. I was out enjoying mine this afternoon, with camera ever in hand, of course. Your rudbeckia must bloom forever, mine have been gone for months! And the Japanese beetles made lace out of my hyacinth beans, so I had to tear them out long ago. So sad, because I loved them! I do especially like how your bottle tree is blooming right now.